CARACAS, Venezuela (AP) — The head of Venezuela’s opposition-run congress said Friday that he is prepared to step into the nation’s presidency temporarily to replace Nicolas Maduro, whose inauguration has been rejected as illegitimate by most countries in the hemisphere. National Assembly President Juan Guaido made the statement to an energized crowd blocking a busy Caracas street a day after Maduro’s inauguration to a second term. 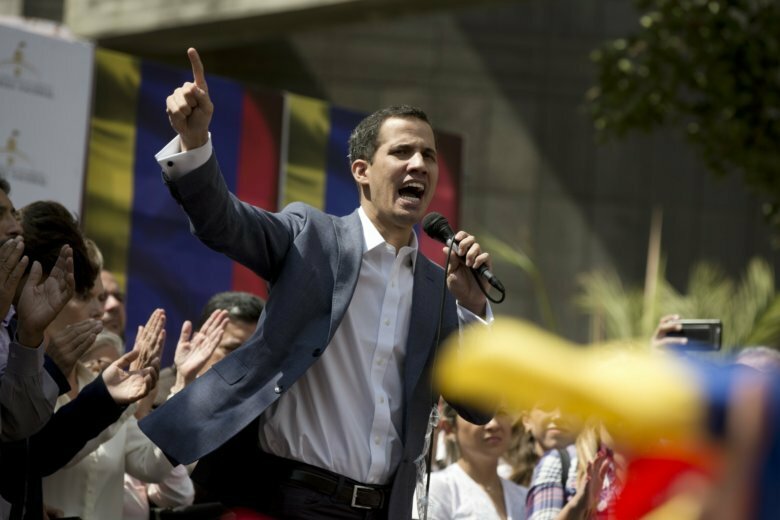 But Guaido said he would need support from the public, the armed forces and the international community before trying to form a transitional government to hold new elections to replace Maduro. The head of the Organization of American States, Secretary-General Luis Almagro, wasn’t waiting. He sent out a tweet recognizing Guaido as Venezuela’s interim president. “You have our support,” Almagro said in a tweet. U.S. National Security Advisor John Bolton later issued a statement praising Guaido, though he didn’t echo Almagro’s step of calling him the interim president. Guaido asked Venezuelans to mass in a nationwide demonstration on Jan. 23, a historically important date for Venezuelans — the day when a mass uprising overthrew dictator Marcos Perez Jimenez in 1958. A once wealthy oil nation, Venezuela is gripped by growing crisis of relentless inflation, food shortages and mass migration. Seventeen Latin American countries, the United States and Canada denounced Maduro’s government as illegitimate in a measure adopted Thursday at the Organization of American States in Washington. In May, Maduro declared victory following an election that his political opponents and many foreign nations consider illegitimate, in part because popular opponents were banned from running and the largest anti-government parties boycotted the race. Friday’s demonstration was the largest showing of anti-government supporters in more than a year, but fell far short of the thousands that took to the streets over four months in 2017, leading to clashes in which more than 120 died. Guaido, 35, made the announcement less than a week after being selected to lead Venezuela’s National Assembly, vowing to press for transition of power. Guaido has won some international support, speaking by phone this week with U.S. Secretary of State Mike Pompeo.